1838. 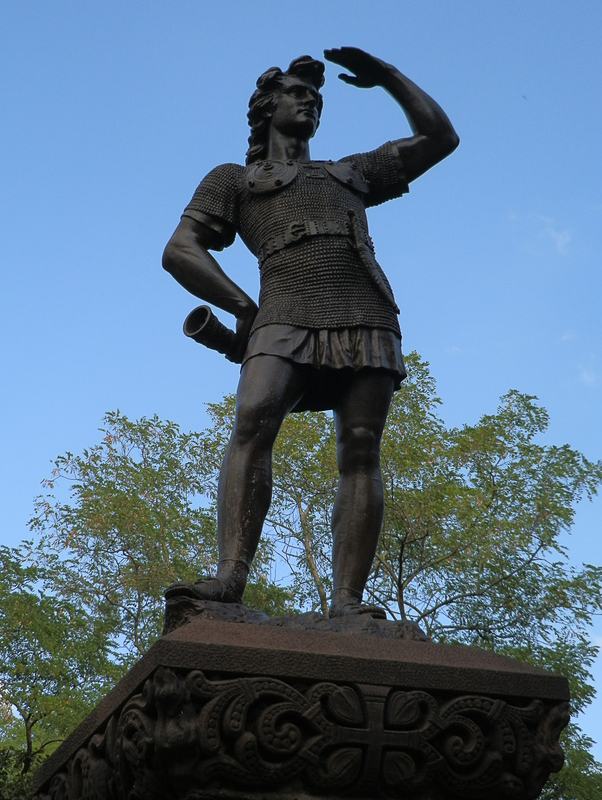 The Norse Sagas about Leif’s discovery of America were translated into English, and American immigrants discovered Leif Erikson’s contribution to history. The sagas reached popularity with the general public in the latter part of the 19th century. 1867. Norway. First discovery of a Viking ship at Tune. The subsequent discovery of the Gokstad in 1880 and the Oseberg in 1903 lent weight to the rediscovery of Leif Erikson’s voyage. 1887. Boston, Massachusetts. 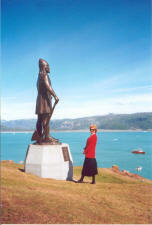 Statue sculpted by Anne Whitney, erected by the efforts of Norwegian violinist Ole Bull, among others. Located on Commonwealth Avenue at Charlesgate East, it became a symbolic bond between America and Scandinavia. 1887. Milwaukee, Wisconsin. 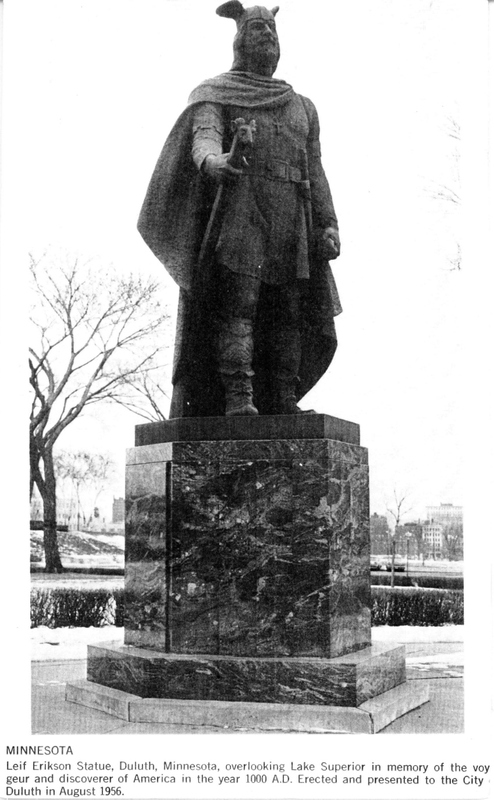 The Milwaukee statue is a copy of the Anne Whitney statue in Boston, and was erected in Juneau Park, on the Lake Michigan lakefront, in November 1887, about two weeks after the Boston statue was erected. At the request of its donor, Mrs. Joseph Gilbert, there was no dedication ceremony. In 2003, lighting was added to the statue. This was an effort of the Sons of Norway Fosselyngen Lodge, Milwaukee County and the city of Milwaukee. 1893. Chicago, Illinois. The Viking, a replica of the Gokstad, sailed from Norway to the World’s Fair in Chicago. The famous painting Leif Eiriksson Discovers America by Christian Krohg was created for the occasion. 1901. Chicago, Illinois. 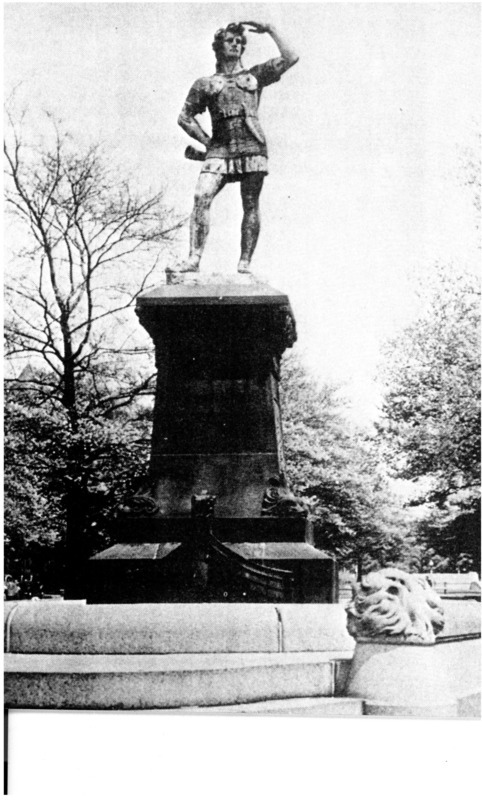 Statue in Humboldt Park, sculpted by Sigvald Asbjornsen and inspired by the Columbian Exposition and World’s Fair of 1893. 1931. Reykjavik, Iceland. Statue sculpted by A. Sterling Calder and presented by the United States government to commemorate the 1,000th anniversary of Iceland’s Althing, the world’s oldest parliament. 1949. St. Paul, Minnesota. 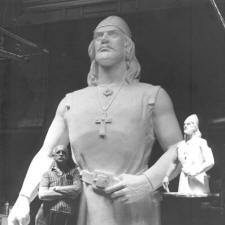 13-foot Leiv Eiriksson statue erected on the grounds of the state capitol, sculpted by John K. Daniels. 1956. Duluth, Minnesota. Replica of Boston’s statue. 1962. Seattle, Washington. 16-foot statue by August Werner erected at Shilshole Marina. 1997. Trondheim, Norway. A 10-foot replica of Seattle’s statue by August Werner was given to the city to celebrate its 1,000-year anniversary. 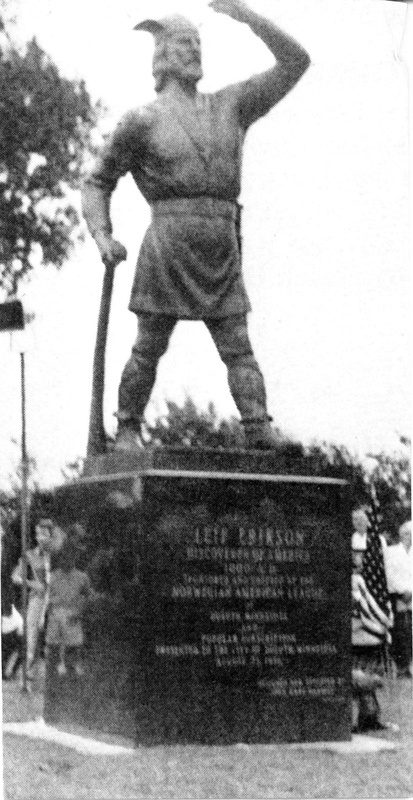 Funds were collected by Seattle’s Leif Erikson Society from donations in honor of immigrants, whose names were inscribed at the base of the statue. 1993. Minot, North Dakota. 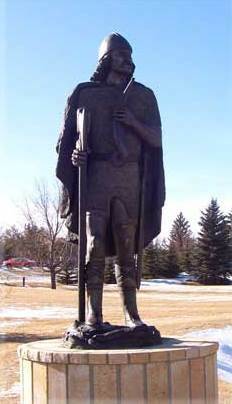 Bronze statue by Arlen Evenson of Boundary Lake, N.D., unveiled in Minot's Scandinavian Heritage Park on October 12, 1993. Sponsored by the Icelandic Heritage Society. 2000. Eiríksstaðir, Iceland. 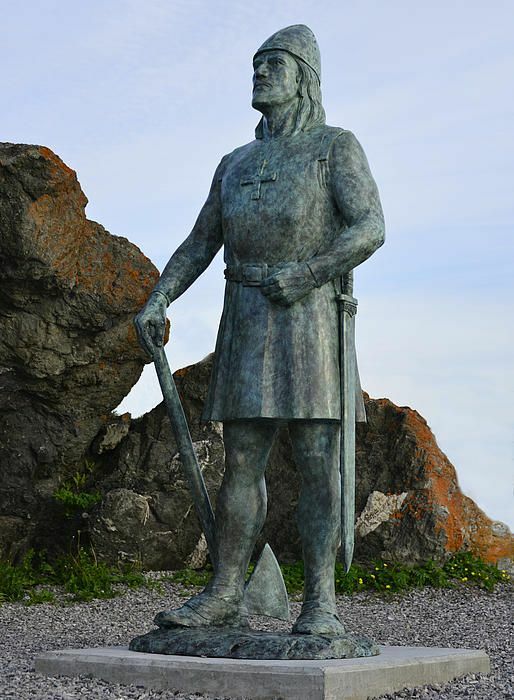 Small bronze statue of Leif standing on the bow of a ship by Icelandic sculptor Nína Sæmundsson. This statue received second place in a competition in the United States in 1930, losing to Sterling Calder’s statue, which was then given to Iceland. Erected in 2000 on Erik the Red’s homestead in Iceland and Leif’s birthplace, on the millennial anniversary of Leif’s voyage to North America. 2000. Brattahlid (Qassiarsuk), Greenland. Second 10-foot replica of Seattle’s statue by August Werner unveiled at Leif’s home and farm to commemorate the 1,000-year anniversary of his voyage. Funding was provided by Seattle’s Leif Erikson International Foundation and the governments of Denmark, Norway, and Greenland. 2001. Cleveland, Ohio. Bust of Leif Erikson, from Seattle’s statue by August Werner. Cast at Riverdog Foundry in Seattle, Wash., under the supervision of Phillip Levine. Funds raised by Emilie Knud-Hansen, organizer of the Leif Ericson Millennium Committee of America's North Coast. 2003. Seattle, Washington. 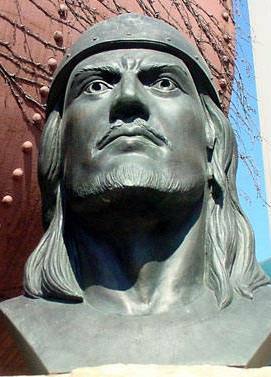 Second bust of Leif Erikson from Seattle’s statue by August Werner. Given to the Leif Erikson Lodge of the Sons of Norway in Ballard in honor of its 100-year anniversary by donors Kristian Berg and Lillian Hagen. 2007. Seattle, Washington. 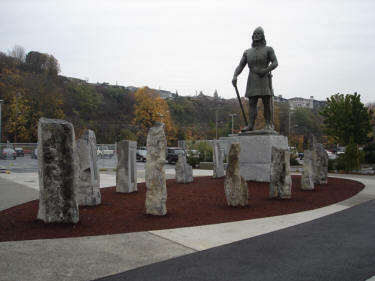 The August Werner statue of Leif Erikson at Shilshole Marina in Ballard was moved from its 1962 base to a new base, surrounded by rune stones bearing the names of Scandinavian immigrants. Jay Haavik, local Norwegian-American artist, designed the base and rune stones. 2007. Newport News, Virginia. The replica of the Calder statue in Reykjavik, Iceland, was moved from its indoor display at the Mariner's Museum to outdoors, on the Museum grounds. 2010. Seattle, Washington. More immigrant names are added to the rune stones surrounding Seattle's statue, bringing the total to 1,767. 2013. L'Anse aux Meadows, Newfoundland. 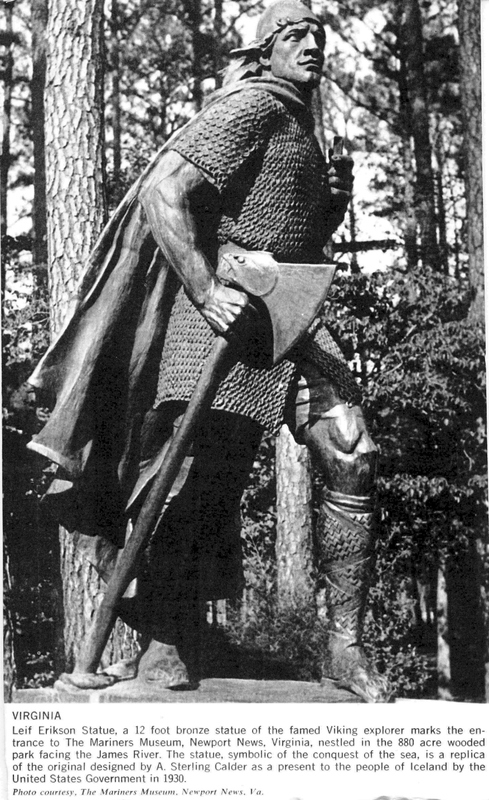 Third and final replica of the Seattle statue erected near Vinland, site of Leif Erikson's homestead. It was cast at Valley Bronze in Joseph, Oregon, under the supervision of well-known Seattle sculptor Phillip Levine. Photo: Wendy Nuttall. 2014. Seattle, Washington. 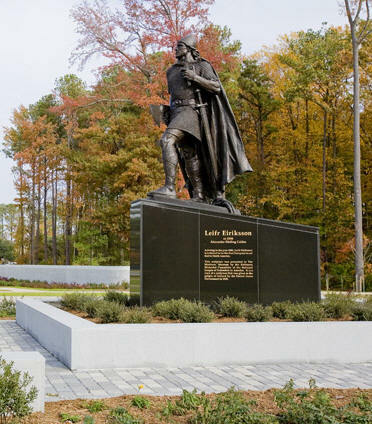 Five hundred nine names of Scandinavian immigrants are added to a plaque on the base of Seattle's Leif Erikson statue, bringing the total number of names to 2,351.